Should I remove It? You don’t know it but Should I remove It does! I quite like the program, however I find it a bit annoying that every time you want some information about a program that it sends you to their website, they could have integrated that with a nice popup for example. The program provides a good list of potentially unwanted software and give the user to remove it. It’s a good tool, but you should still use your own opinion to judge whet ether you need to remove more than advised, or less than advised. Should I remove It is a light-weight Windows program that analyses all your installed programs on your system. 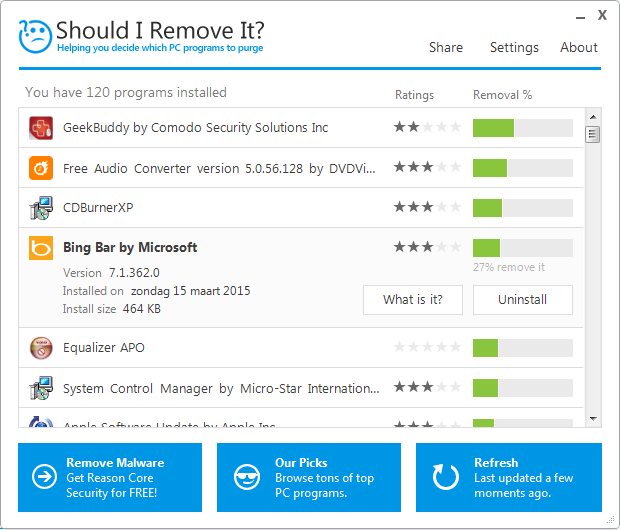 After it has finished analysing your computer you get back a ranking list with all the software and how many people ended up uninstalling it, and what the current user rating is. Why Should I remove It and not the Program and Features tool from Windows itself? Now only one click is required after you read what the program does, and that is hitting the Uninstall button and the Should I Remove It tool will start the removal of the program.